This is probably my best attempt to sum up these posts (1, 2 & 3) in easily digestible form. The image of God is reflected in marriage in the created order. It ties with what Augustine said when he described the Trinity as Lover, Beloved and Love. Before you shoot me for heresy and say that I demean the person of the Holy Spirit, by making Him an arrow, not a circle, think carefully where you would get your texts to shoot me from. I fully believe that the Spirit is a person, but that personhood is expressed in a different way in the divine life to the other two. I have only ever seen divine dialogue in the bible, never divine trialogue. Father talks to Son and Son to Father, but you never catch the Son having a chin wag with the Spirit, (at least I haven't come across one yet) or the Father doing the same. The Spirit speaks to and through the believers, but not as a defined stand apart entity within the Godhead to the Godhead. Nice of you to drop by Matt! Interesting and thought-provoking discussion and I am with you in finding's Ware's perspective a bit inadequate. (I haven't read the book but I'm thinking of your first diagram). 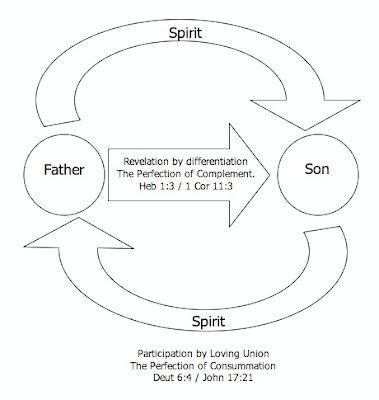 The interaction shown in diagram 2 is more satisfying, I think, both from a biblical perspective and also from my experience, for what that is worth.